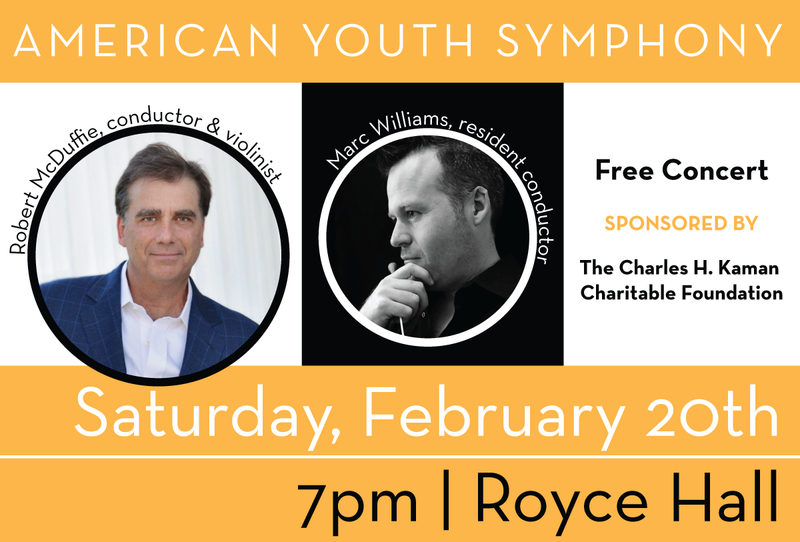 Grammy-nominated violinist Robert McDuffie will join the American Youth Symphony as conductor and soloist for Philip Glass' "The American Four Seasons", at 7pm on February 20th, at UCLA's Royce Hall. On Saturday, February 20th at 7pm, in UCLA’s magnificent Royce Hall, Grammy-nominated violinist Robert McDuffie will join the American Youth Symphony in a concert featuring Philip Glass’ The American Four Seasons and Rimsky-Korsakov’s Scheherazade. The American Four Seasons was written as a modern counterpoint to Vivaldi’s baroque classic, dedicated by Glass to McDuffie himself! Maestro McDuffie gave the world premiere of The American Four Seasons with the Toronto Symphony, and completed a thirty-city U.S. tour with the Venice Baroque Orchestra, pairing the Glass Four Seasons with the Vivaldi Four Seasons. McDuffie will serve as both soloist and conductor for this piece, leading orchestra and audience through the work that was written for and inspired by him. Rimsky-Korsakov’s Scheherazade, the musical telling of the classic Arabian folk tale, will be led by AYS Resident conductor Marc Williams. Maestro Williams regularly conducts various ensembles on the East Coast of the United States, having made his Carnegie Hall debut leading the New York–based contemporary music ensemble Second Instrumental Unit, of which he served as co-executive director and principal conductor. He also recently served on the conducting staff at Spoleto Festival USA for seven seasons as Resident Conductor and assistant to the Music Director. This concert is presented free to the public, and is sponsored by the Charles H. Kaman Charitable Foundation.